So ends the earliest gospel narrative, describing the reaction of the women who, on arriving at the tomb where Jesus’ crucified body was laid, and expecting to perform the last rites of anointing, were confronted instead with his absence and a startling message of resurrection. Terror and amazement were the initial response, not joy and vindication of realised hope.These were for later. This picture of a flimsy suspension bridge across a wide watery chasm evokes for me something of what I imagine such a confrontation may have meant to those who first entered the empty tomb. Like a good many folk, I have my irrational fears and phobias. When I first saw this image, it awoke my two boss bêtes noirs – a panic of water and a fear of heights. Both evoke instant nausea. Yet the picture draws me in. I am curious to see what’s on the other side, and I am almost compelled to make the first tentative step, trusting that the cable and the flimsy slats of wood will hold. Terror, amazement, hope and purpose combine into a terrific maelstrom that can be negotiated only one step at a time. Is resurrection like this? It is a call to something new and transformational. Bridges are archetypes of transition. What is known and familiar is left behind for a new thing that is as yet undiscovered and inviting of exploration. Terror and amazement are appropriate initial responses. The empty tomb of the first Easter must have been like that for the friends and followers of Jesus. They said nothing to anyone for they were afraid. Obviously, someone sometime took that first tentative step and said something, because we tell the story today. I love this: because it outlines how painful sudden change can be, yet how imperative. One step at a time….a very good policy. Painful, yep – even for the greater good. 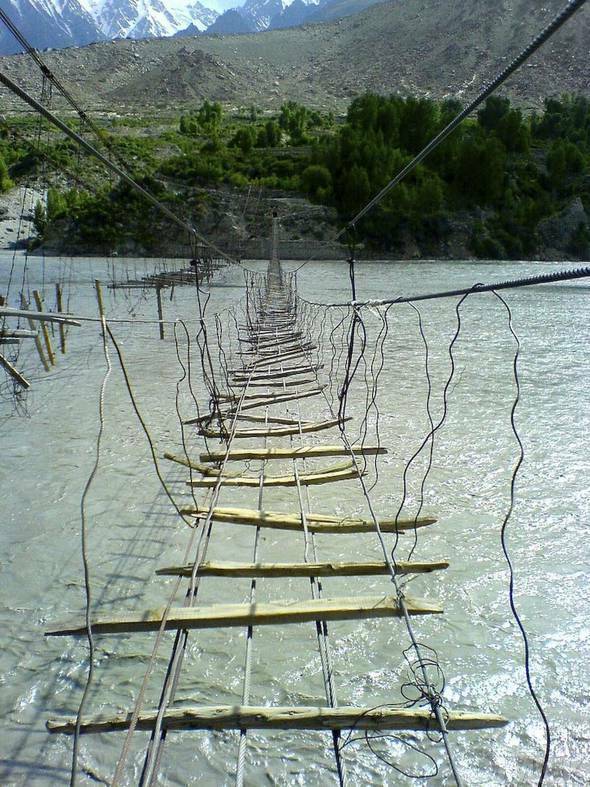 It also shows the risks one needs to take on all journeys of change…..and halfway there one can only go forward!